Support SGN with your TIME and SKILLS! Stop Genocide Now is always looking for people like you to join our community and contribute your skills and time. Our current team currently communicates primarily via the internet and conference calls, you too can join! We are a small yet diverse team made up of regular people – just like you! Interns: We are looking for interns who can spend at least 10 hours a week with our team working on various projects. Interns will help develop projects, manager on-going campaigns, create media materials, and learn how SGN works. We will work with your university or college to arrange credit. Email Katie-Jay for an application. Grant Research and Writing – As SGN expands, we need help funding our projects and new staff members. Currently we have a very small paid staff and would love to have the opportunity to hire some of our volunteers and expand our projects for greater impact. We have a few dedicated volunteers working on research and writing, but the more eyes on a document and the more minds for creative and concise proposals, the better! This can be done on your own time and from the comfort of your home! You will be supported by several team members in our joint efforts! Artistic and Multi-media Support – We are looking for volunteer team members to help us figure out the best way to create a traveling art exhibit with drawings, letters, and testimonies from Darfuris. Supporters have always thought a book of photos and stories would be an incredible way to record the journey and horrors that our friends have experienced. Do you have another artistic thought, we are open to your idea! Legal Advisor – Stop Genocide Now is looking for legal advice surrounding non-profit status, IRS, partnership contracts, and general support for questions. Public Relations/Media Specialist – SGN, Camp Darfur, and other projects provide fantastic opportunities for the media to link people in the US and abroad to the refugees living in camps. We are looking for someone who can join the team long term and help with writing press alerts and releases, following up with media contacts, outreach, establishing relationship with media contacts, and help the voice of the refugees get out into the world. Ideally this would be someone who would join our core team and keep up with all our various projects, providing ideas for media outreach and features. Development/Donor Team – We are looking for a few volunteers to help us create long-term donor development plans and fundraisers. We have a small team of innovative and creative people who are dedicated to making the personal connection to refugees the center of the relationship between possible donors and SGN. With your help and ideas, we can expand SGN programming! General Team Members – We are always looking team members who can really help strengthen our team by taking on a more permanent role on the team. Spread your skills across the many needs of this almost all-volunteer team, learn and grow as you help to foster a culture of participation. 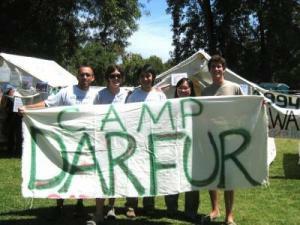 If you are interested in taking your Darfur activism to a new level and for the long term, please let us know. Let us know about any areas of interest or skills that you can offer. We are very open to being creative and finding the power to make a difference within each individual. If any of these opportunities peak your interest or if you have questions, please feel free to email Katie-Jay at ktj[at]stopgenocidenow.org.